From Christ Statue to Sugarloaf Mountain, most of Rio’s bucket-list sites involve scaling mountains to soak up the views. To out-smart the crowds in high season, book ahead, go early, or hop in a helicopter from the Lagoa to marvel at the city’s spectacular topography in a hassle-free 20 minutes. No trip to Rio is complete without a day soaking up the enigmatic beach scene of Ipanema, watching beach volleyball games, while sipping from cold coconuts and applauding the setting sun along with the crowds who gather on Arpoador rock. Then, when you tire of the sand, there’s the world-class Botanical Gardens, trendy restaurants, bars and boutiques of Jardim Botanico and the bohemian, cobbled stone streets of Santa Teresa, with its yellow bonde (tram) and artists ateliers, to explore. Finally, don’t miss a football game at Maracanã Stadium, the magnetic atmosphere is worth the trip alone. If Rio has traditionally fallen short when it comes to world-class museums and galleries (with beaches like that, who can blame it? ), the recent opening of the sustainability inspired ‘Museum of Tomorrow’ and thought-provoking Modern Art museum (MAR), both part of the multi-million R$ regeneration of the docks, has taken the city to new cultural heights. Hot on their heels comes the much-anticipated Museum of Image and Sound in Copacabana. 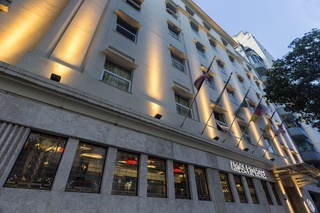 To experience lingering vestiges of Rio’s grand colonial heritage, take coffee at Belle Époque café Confeitaria Colombo, visit the Baroque Monastery of Sao Bento hidden in the heart of the financial district, marvel at the elaborate Portuguese Library or pay a visit to the colonial mansion of Parque Lage, now an art school hosting a dynamic roster of cultural events. Then there’s the Samba – catch nightly performances at intimate Carioca da Gema in Lapa, jam with the locals to the authentic alfresco Monday and Friday night sessions at Pedra do Sal, or head to Bar Da Laje in Vidigal, Rio’s safest and most gentrified favela, where Saturday afternoon feijoada and samba are set to spectacular views over the city. While Rio’s laid-back beach culture means that you’ll find more snack bars than Michelin-starred restaurants, a spate of openings specialising in innovative contemporary Brazilian food has added a new level of sophistication to the market: don’t miss the tasting menu at Lasai, or lunch on the al fresco terrace at Pedro Siqueira’s Puro. For fine dining, Brazil’s big name chefs Roberta Sudbrack and Claude Troisgros still hold sway, but for a special occasion, book into atmospheric Aprazivel, where Brazilian classics and 5* caipirinhas are served in a stunning tiered garden. Buzzing Dias Ferreira is Rio’s destination dining street and great for people watching, hosting sophisticated snack bars like Riba and Boteco Belmonte, design-store-turned-restaurant Poeira da Lata, French-fusion bistro Brigite’s and the chic Japanese spot Sushi Leblon. For local favourites, head for cocktails and fusion flavours at Zazá Bistrô or succulent picanha steak at Braseiro, where great value and a fun family vibe means queues regularly snake out the door. While beer bars abound (Jobi, Astor and Bar Urca are among the best), cocktail bars like Bar d’Hôtel, Canastra and Subastor are popping up, and there’s a new health conscious kick taking hold, inspired by the city’s first raw restaurant Ró, vegan restaurant Teva and healthy café Kraft. For a quintessential Brazilian dining experience, tick off the feijoada (black bean and pork stew) at Bar do Mineiro, a churrasco (all you can eat meat feast) at Fogo do Chão and grilled fish at gourmet beach kiosk Atlántico Rio. One of the best things to buy in Rio is beachwear, so don’t miss picking up a Brazilian-style bikini or sunga (those tiny trunks beloved by Brazilian men) at VIX, Blueman or Lenny. While Brazil’s big name brands, including aspirational beachwear designer Osklen, can be found in the shopping malls (Rio Design and Fashion Mall are the best), many leading independent designers skip the high rents of the high street to showcase in ateliers in Jardim Botanico. For the best of Brazilian fashion and design, check out chic boutique Dona Coisa, concept store Os/On, creative hub Casa VV, design emporium Gabinete and the furniture atelier of Fernando Jaeger, all set along and around Lopes Quintas street. While Rio’s reputation as a fun-loving, hedonistic beach city rings true, this is balanced by an incredible connection to nature that few global cities can compete with. For a gentle approach to Rio’s sporty side, wake early to stroll the deserted sands of Ipanema, hire a bike to ride around the lake, take a paddle-board out from Copacabana beach, or walk one of the many jungle trails in the Tijuca National Park. Adrenaline seekers should check out mountain biking up Vista Chinesa, climbing Pedra da Gávea, kite-surfing on Barra Beach and hand-gliding over São Conrado. For a special experience, locals love to hike up the jungle trail that starts at the top of Vidigal favela and weaves for an hour up the back of Dois Irmãos Mountains to watch dawn break over the city. From surf-spot Prainha to the sweeping golden sands of Grumari, Rio’s best beaches lie a little under an hour’s drive to the West of the city. Make a day of it and visit the former private-home-turned-cultural-centre of landscape artist Roberto Burle Marx, eat a moqueca at restaurant Bira da Guaratiba, paddle-board through the nature reserve of Mangatiba before watching the sunset from Point de Grumari. Alternatively, head up into the Serra mountains that surround the colonial town of Petropolis, where the city’s smart set have summer houses to escape the heat and you’ll find wooden chalets, organic farms, colonial palaces, artisanal breweries and great nature walks.